I don’t always like to use oil when I prepare eggs, so that leaves me with the options of either hard-boiled (which I make often) or poached. And more often than not, I’m too lazy to poach them. I’ve found that mollet eggs are the perfect solution. This technique, which I first saw used by that French culinary sage, Jacques Pepin, is foolproof. First, bring a saucepan of water to a boil. 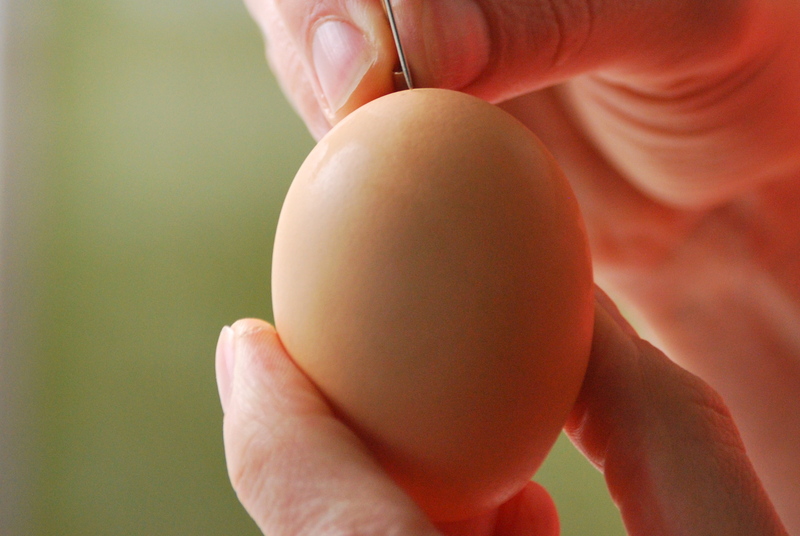 Use a pin or thumbtack to poke a hole into the largest end of the egg. This hole prevents the egg shell from cracking while it’s cooking. Boil the eggs for six minutes and then pour out the water. Shake the pan to crack the shells a bit. Finally, peel the eggs under cold, running water. The water gets under the shell and membrane, causing it to slough off without taking any of the firm egg-white. The egg is perfect every time. 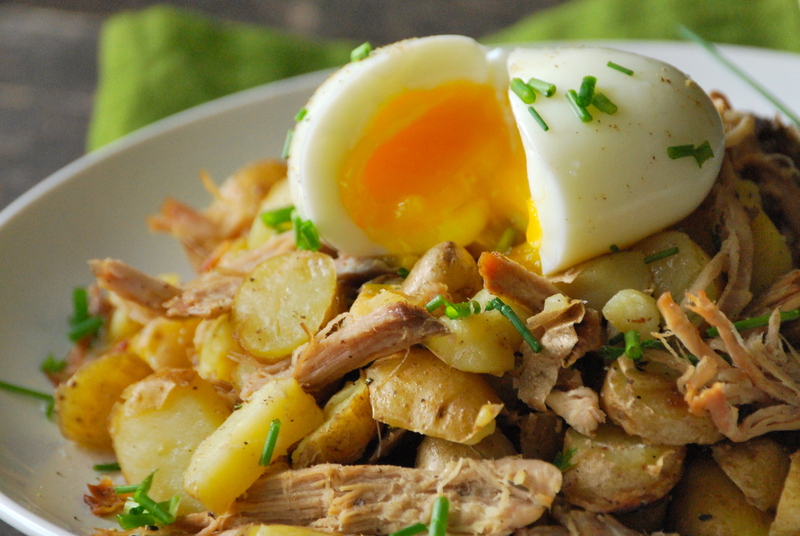 Now the egg is only part of this breakfast dish. We love hash– the perfect big breakfast to start the weekend. It’s even better when you have friends come over to enjoy it with. I make the pork shoulder in a crock pot, though of course you can just use your oven and braise the pork shoulder if you like. One of the things I love about this meal is that most of it can be made in advance. Much of the morning can be spent visiting and sipping on a cup of French-press coffee. I love being able to make most of this meal ahead of time, it makes the morning so much more relaxing. And even better, the leftovers (if you somehow have any) heat up very well, and make a fine lunch. Here’s to your next weekend breakfast! To make the pork shoulder: The night before you plan to serve it, place the pork shoulder seasoned with kosher salt and fresh black pepper, 1/2 white onion cut into chunks, garlic cloves, 1 rosemary sprig, thyme, and 1/2 cup of water (or a bit more, if you see fit) into a crock pot set at low. Leave on overnight. In the morning, remove the meat and and shred it with two forks, discarding any fat. Add the soft garlic cloves to the meat. Set aside. Prepare the potatoes the night before, as well. 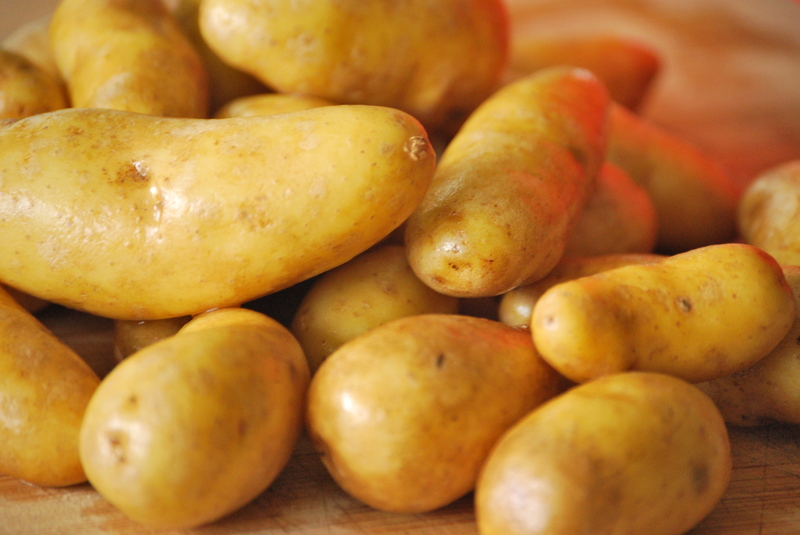 Add the potatoes to a large saucepan with a steamer inserted into it. Set the heat to medium-high and cover with a lid. If they don’t all fit into your pan, steam them in two batches. Steam for 10-15 minutes, depending upon the size of your potatoes, or until a knife inserted into them goes in with ease. Let cool and place them covered in the refrigerator overnight. Dice them in the morning. In the morning, heat a large skillet (mine is 14-inches) to medium-high heat. Add the olive oil and then sauté the onion until it develops a nice golden color, about 5-7 minutes. Add the celery and sauté until it softens a bit. Sprinkle kosher salt and fresh black pepper into the pan. Add the diced potatoes and cook until they are heated through and have developed a bit of a golden color to them. Add the shredded pork shoulder to the pan and continue to sauté until everything is hot. Re-season, if necessary. Sprinkle with chives and chop up the remaining rosemary sprig and add that, as well. Meanwhile, while the potatoes are cooking, bring a medium saucepan filled with water to a boil. When the potatoes are on the verge of being done, gently push a pin or thumbtack into the large end of each of the eggs. Gently lower them into the boiling water. Reduce the heat to a small boil. Set a timer for six minutes. When the timer goes off, remove from heat. Drain the hot water into sink leaving the eggs in the pan. Gently, but with a bit of force, shake the pan back and forth, so that the eggs crack a bit. Run some cold water and begin to peel the eggs underneath it. It is important to get the water under the shell and the membrane. Once that occurs, peeling the egg will be a cinch. Dry the eggs on a paper towel. 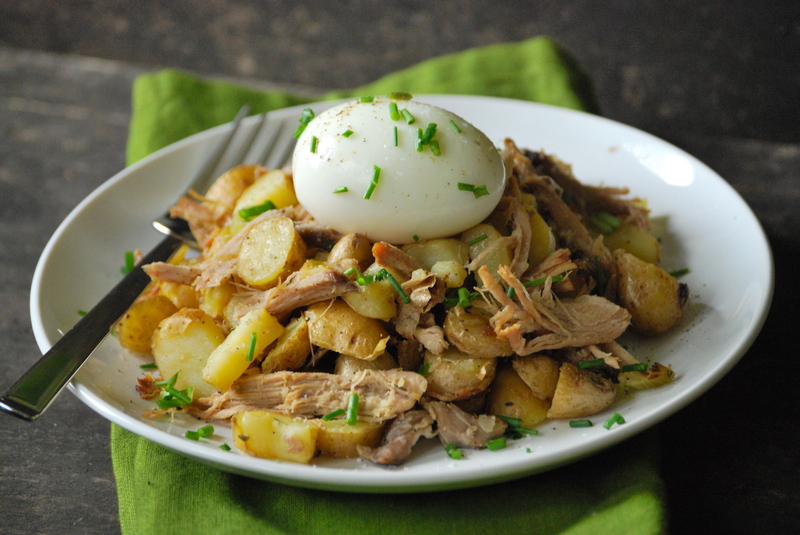 Have the pork shoulder hash plated and place one egg (or more) on the top. 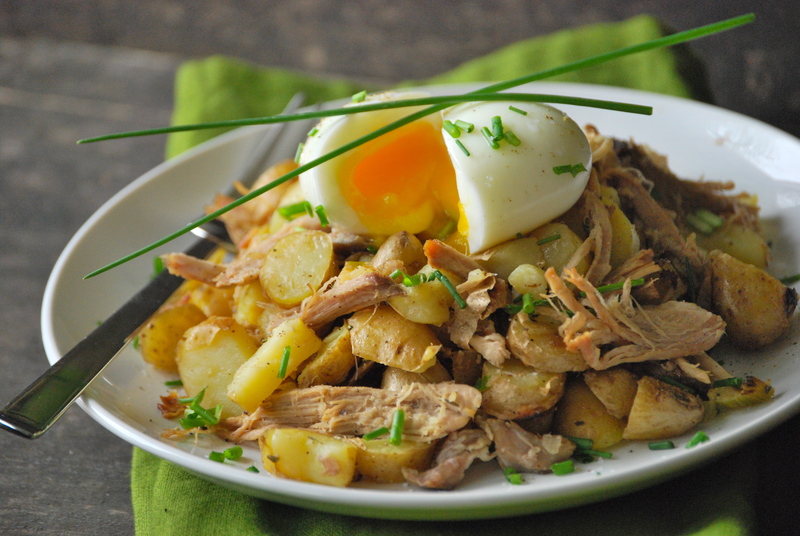 Cut into the egg and enjoy the golden yolk oozing all over the crisp potatoes and pork shoulder. Enjoy! You are a dear. Come over for breakfast anytime! YUM, YUM, YUM! I’ve had other variations of this, but this looks great. I can’t wait to try my eggs this way. And as always, a gorgeous post. Thanks so much, Brenda! I love eggs this way — just had a couple for breakfast with my daughter. I love that they’re not fussy or need to be tended to. Just boil and peel! That egg looks like the perfect egg! And I bet it melts perfectly on that hash!